SIL Language Assessment specialists gather linguistic, sociolinguistic, and community information for strategic language development planning. Effective language development requires a clear understanding of the sociolinguistic environment and the means to assess the effectiveness of language development activities. SIL language assessment specialists make use of existing research material whenever possible and add their own primary data. The research is not uniform in depth and each survey is governed by many factors. The answers to some questions are more easily obtained, but some research requires longer term participant observation and ethnographic research. 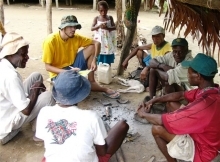 The resulting analyses are shared with partners (including the members of the community that has been studied) for making language program planning decisions. The data are also reported to the academic community through our publications, including books and electronic survey reports.